12 oz. Hummerfest Feeder. High-impact polycarbonate construction. Rain deflectors and built-in ant moats deter insects and prevent contamination. Lifetime Guarantee. 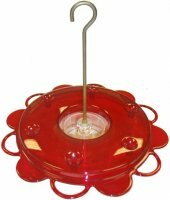 If you are looking for a hummingbird feeder that is easy to clean and fill, pick one of our Hummmerfest Hummingbird Feeders. This one holds 12 oz. and is loved by hummingbirds because of the perching area. This product is not made by Erva - and is Imported.